The publisher reserves the right to reject any advertisement regarded as objectionable in wording or appearance and may require the word “advertisement” in any ad. All advertisements are accepted and published upon the representation that the agency and/or advertiser is authorized to publish the entire contents and the subject matter of the advertisement. The agency and/or advertiser will indemnify and hold the publisher harmless from any loss or expense resulting from claims or suits for defamation, libel, violation of right of privacy, plagiarism or copyright infringement, including but not limited to trademarks, trade names and patents. No redesign of ads after noon on Monday. Deadlines may vary on holiday weeks. Publisher may hold advertiser and its agency jointly and severally liable for all sums due and payable to the publisher. Advertising must be inserted within one year of first insertion to earn frequency discount rates. Insertions must run in 52 consecutive issues to earn 52-time rate. Frequency discounts will be allowed in advance on those contracts that specify units of space. Multiple ads in one issue are counted as one insertion. Advertising contracted at a frequency discount rate and not earned within one year from insertion will be billed at the actual earned rate (short rate). Mixed sizes of ads in a campaign are welcomed. Prepayment is required with all new accounts for the first four (4) insertions. Payment must accompany all copy unless credit has been previously established with the Credit Department. All advertisers wishing to establish credit must submit a completed credit application. The term of credit extension to all advertisers is net 30 days. No cash or prepayment discounts. Accounts extending beyond 90 days are subject to forfeiture of agency discount and could incur legal and collection fee charges if collection proceedings are necessary. Ads canceled after 5 p.m. on the Monday prior to publication will be billed at 100%. The Rochester Business Journal will not be liable for any error in any advertisement published hereunder unless proof of such advertisement is requested in writing by the advertiser and is returned to the newspaper’s office with such error or correction plainly noted in writing thereon, and, in that case, if any error so noted is not corrected by the newspaper, its liability shall not exceed the cost of the space occupied by the error. Agencies and advertisers forwarding orders that contain incorrect rates or conditions understand and agree that the advertising called for will be inserted and charged at the regular schedule of rates now in force and in accordance with the current regulations. A failure to make an order correspond to current price or rules will be regarded as a clerical error only, and the advertising will be inserted without further notification. The publisher is not liable for any failure to publish or circulate all or any part of any issue because of circumstances beyond the publisher’s control. All correspondence, insertion orders and display advertising printing materials should be addressed to: Rochester Business Journal, 16 W. Main St., Suite 341, Rochester, New York 14614. Preferred format is Adobe Acrobat PDF. Digital ad materials must be provided in PDF (Acrobat 5.0 compatible) InDesign CS. We also accept Adobe Illustrator EPS files with fonts converted to paths and artwork embedded, or Adobe Photoshop EPS or TIFF files. We cannot accept any ads created in any Microsoft programs, as these do not produce usable graphic files. Fonts must be 100% embedded, with no subsets, when providing an ad in PDF format. All 4-color artwork must be saved in CMYK format, with no spot, LAB or RGB colors. 4-color PDFs must be color composite documents (not multi-page, separated PDFs). Color graphics and images saved as RGB, Lab, Indexed color or duotones are not acceptable. Artwork for black-only ads must not contain RGB, CMYK or spot-color elements. All scanned halftone images should be sized at a resolution of at least 300 dpi at 100% of the size they are used in the file. Line art images such as logos require an image resolution of 300 dpi. Materials are due five days prior to issue date for main section of paper and two weeks prior for special publications. 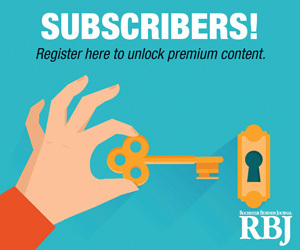 The email address for submitting ad materials is production@rbj.net. Please contact your account manager for additional information regarding electronic ad submission. For help preparing digital files, please call the Rochester Business Journal Production Department at (585) 546-8303, Ext. 160, 8:30 a.m. to 5 p.m. Monday through Friday.